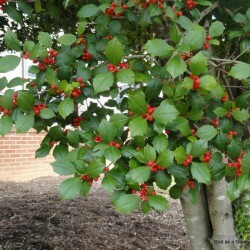 American holly is an elegant evergreen tree that's ideal for home landscapes. 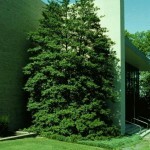 Its dense branching, pyramidal habit and smooth gray bark are only a few of the appealing attributes of this broadleaf evergreen. Wild specimens grow in forests across the eastern half of the United States, from Maine to Texas, and are particularly common from the Appalachian Piedmont to the Atlantic coastal plain. 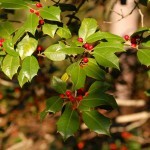 The spiny, oval leaves of American holly are stiff and dull, dark green. Cultivars tend to have slightly glossy foliage. Sharp, yellowish spines that are painful to the touch arm the undulating leaf edges. Each leaf will persist on a tree for up to three years before falling. 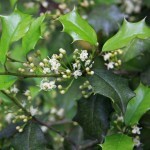 Small, white or greenish flowers appear in late spring or early summer on the current year's growth. The trees are dioecious, which means each specimen has either male or female flowers, never both. Only female trees yield red or orange-red berries in the fall, but male trees are needed for pollination and fruit-set. The colorful berries last well into the winter. Birds will eat the fruit over the course of the season. 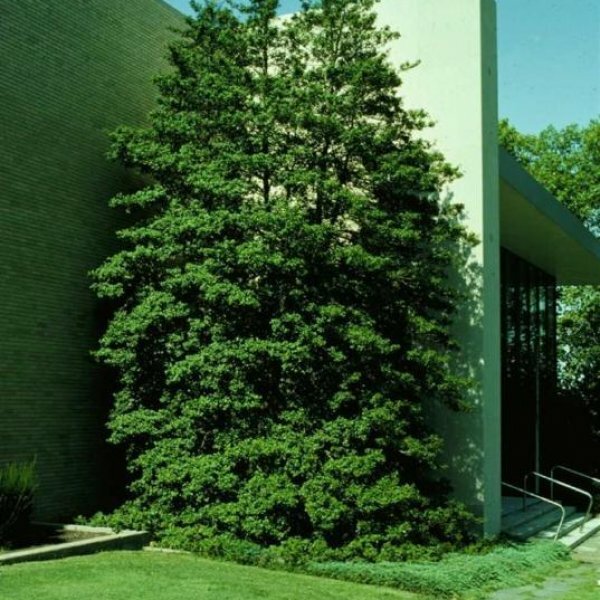 Landscape specimens perform best if provided plenty of sunshine and fertile soil with an acid to neutral pH. Established trees are tolerant of drought and will withstand the wind, saltspray and sandy soil near the ocean. Drying summer or winter winds, however, cause leaf desiccation. 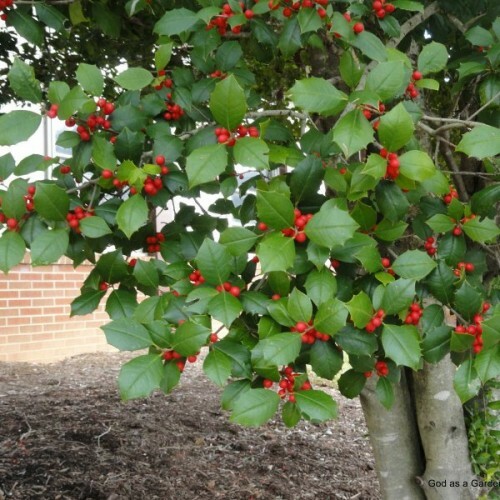 American holly also grows best in moist, average to well-drained soils rich in organic matter. Fast-draining sandy soils may be wet without causing these trees to succumb to root rot and fungal diseases. Germination 1. Grow holly from seed in autumn once daytime temperatures dip below +10C (50F). Soak the seeds in a bowl of cool water for 48 hours to soften the hard outer hull before sowing them. 2. Fill a seedling tray with a mixture of 3 parts compost and 1 part perlite. Firm the mixture and add more, if necessary, so the seedling tray is filled to the brim. 3. Sow the holly seeds in the seedling tray one inch apart and 5-8 mm (1/4") deep. Spread a thin layer of coarse sand onto the surface of the mixture to help hold in moisture and to keep it cool. 4. Moisten the potting mix to a depth of 25 mm (1") using a garden hose with a misting nozzle attachment. Maintain moisture within the mixture at a depth of 25 mm (1") at all times during germination. 5. Place the seedling tray into a ventilated cold frame after sowing the holly seeds. Do not move the seedling tray once it is in the cold frame since sudden temperature fluctuations will cause the seeds to go dormant. 6. Close the ventilation on the cold frame in spring to help hold in warmth once daytime temperatures rise above +20C (68F) during the day. Check the moisture level in the growing mixture often since the warmer temperatures will dry it out faster than during the cold winter months. 7. Watch for germination in late spring, but do not be discouraged if seedlings don't appear until autumn. As soon as they appear, transplant the holly seedlings into 3-4 L (1-gallon) nursery containers filled with garden soil. 8. Keep the nursery containers inside the cold frame until the following spring. Water them regularly to a depth of 25 mm (1") to keep them from wilting. 9. Move the holly seedlings from the cold frame to a sheltered, partially shaded spot once daytime temperatures reach +15C (60F) in the spring. Keep them in their nursery containers until they grow to 15 cm (6") in height, and then plant them in a sunny bed with good drainage. (Info source: eHow.com).